What Should You Include in a Roadside Emergency Kit? Ice and snow may not be common in California, but getting stranded in the summertime with no water can be just as dangerous as getting stranded in the winter with no heat. At the end of the day, every motorist should have a roadside emergency kit in his or her vehicle regardless of location. [Read more…] about What Should You Include in a Roadside Emergency Kit? The California False Claims Act is a complicated piece of legislation that addresses various kinds of misconduct. It was enacted to protect the state from financial fraud and to provide an avenue for recovering public funds that were wrongfully obtained or distributed. [Read more…] about What Is a Qui Tam Lawsuit? Sexual harassment in the workplace is somewhat of a gray area because what one employee might consider friendly or gregarious, another might find to be an unwelcome advance. At the end of the day, though, everyone has the right to a certain level of comfort and security at work, and if anything—or anyone—violates that right, they have legal recourse. [Read more…] about What Constitutes Sexual Harassment in the Workplace? 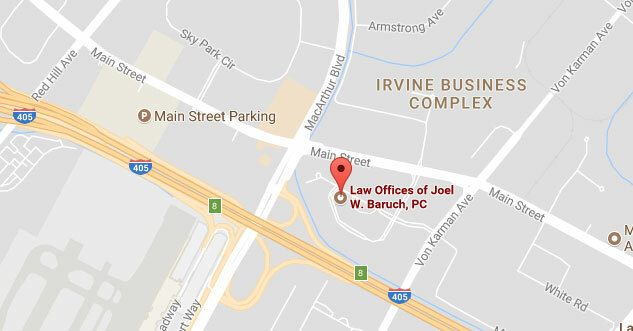 Joel W. Baruch has been nominated and accepted as a two years AIOPIA’s 10 best in California for client satisfaction.